A PEW study on European Attitudes shows social mood is darkening in the Eurozone, but especially in France. The 78 page study “The New Sick Man of Europe: The European Union” is worth a look in entirety, but let’s turn the spotlight on France. The euro crisis first undermined France’s economy, and now there is strong evidence that it has severely eroded French public attitudes toward the economy, the European project and the country’s domestic leadership. Moreover, France has always bridged Europe’s north and south. French language and culture has Latin roots, but France has historically been considered in the same economic and political league as Germany and Britain. And in their public attitudes, the French were neither Northerners nor Southerners, but a hybrid of the two. Now, measured by a number of indicators, the French look less like Germans and a lot more like the Spanish, the Italians and the Greeks. In the current poll such sentiment reaches a new low, with just 9% saying the economy is performing well. And that judgment is down 21 points since 2007. Only 11% of the French think their economy will improve over the next 12 months, making the French among the most pessimistic of Europeans. And just 9% think their children will be better off financially than their parents, by far the gloomiest forecast for the next generation. The economic downturn over the past six years has also sharply increased the portion of the French population suffering basic deprivation. And reported incidences of not having enough money to pay for food and health care over the past year have increased more in France since 2007 than in any other of the EU countries surveyed. The French have long had their doubts about whether European economic integration has been good for the French economy. In 1991, the year before creation of the single European market, a plurality of 44% feared that integration would weaken France. Today, these doubts have morphed into strong convictions. Nearly three-quarters (77%) of the French think closer business ties with the rest of Europe have undermined their overall economy. In 2004, 69% had a positive opinion about the Brussels-based institution. But by 2013, just 41% have a favorable view. Moreover, more than half (53%) of the French oppose giving more decision making power to Brussels. And only 40% would consider financial assistance to other EU nations facing economic distress, down from 53% in 2010. Nevertheless, 63% of the French want to keep the euro and not go back to the franc. That 33-point difference six years ago is now a 66-point difference, as just 9% of the French and 75% of Germans see their economy as good. Moreover, the French and the Germans differ so greatly over the challenges facing their economies that they look as if they live on different continents, not within a single European market. Fully 80% of the French say unemployment is a very big problem; less than a third (28%) of the Germans agree. About two-thirds (68%) of the French think inflation is a major issue, while just 31% of Germans are similarly worried about rising prices. And 71% of the French are very troubled about public debt; only 37% of the Germans share such intensity of concern. The French and the Germans also disagree on whether to help out other European Union nations in distress. And their positions have flip-flopped. In 2010, roughly half (53%) the French backed bailouts, while only 42% of Germans agreed. Today, about half (52%) of the Germans support such financial assistance, while just 40% of the French do so. More than nine-in-ten Spanish, Italians and Greeks think their economy is doing poorly, as do roughly nine-in-ten French. About two-thirds or more in all four countries think their governmental leader has done a bad job handling the economic crisis. 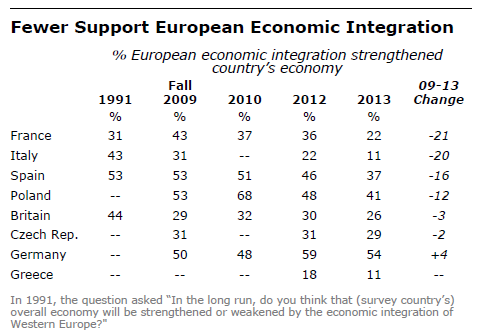 Nearly three-quarters of the French, Greeks and Italians believe that economic integration has been bad for their country. More than half of the French, Spanish and Greeks look unfavorably on the EU. And by all of these indicators, French attitudes have worsened dramatically since 2007, much as has sentiment in Spain and Italy, for which there are comparable data. Leaders are still committed to the eurozone project with Brussels having still more control, but the average European citizen sure isn’t. Interestingly, just 18% in France back a Keynesian solution to their woes even though socialists are in control. A pair of key charts from the report shows increasing skepticism towards further integration. People’s confidence in the European Union as an institution is waning even faster. A median of only 45% now think favorably of the Brussels-based organization. That support is down 34 percentage points in Spain, 21 points in France and 20 points in Italy. For now, the majority in France, Germany, Italy, Spain, and Greece want to remain on the euro even as distrust of the nannycrats in Brussels mounts. Given such strong sentiment against further integration, I wonder how long support for the euro can last, but it sure is not forever. Adding fat to the fire, the euro itself cannot possibly survive in its current state.